The George H.W. 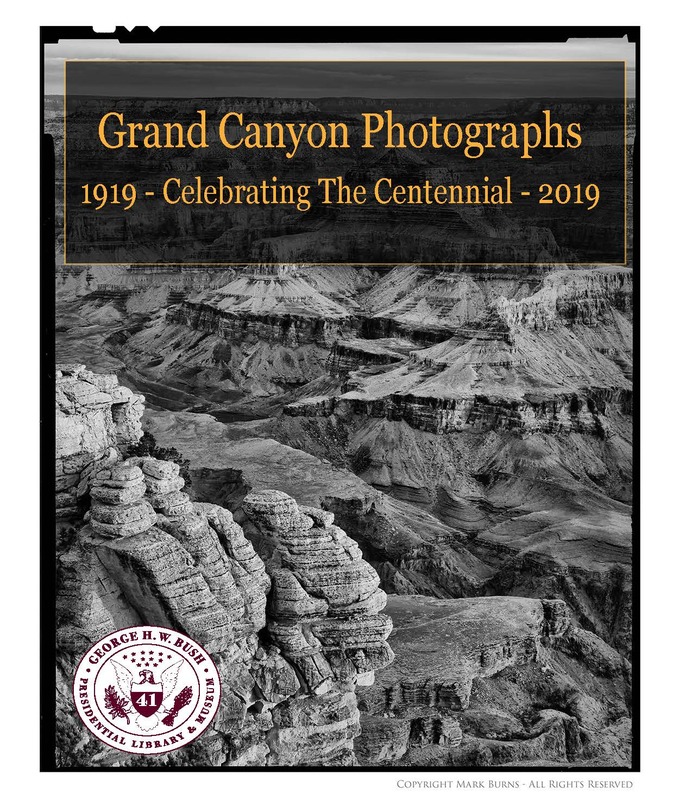 Bush Presidential Library and Museum is excited to announce our newest exhibit, “Grand Canyon Photographs: Celebrating the Centennial 1919-2019.” This photography exhibit will feature some interesting "vintage looking" panoramic images shot on film, as well as some night photography shot with modern digital equipment. In addition to the traditional and contemporary still photography, a large 4K digital monitor will play a looping time-lapse video that compresses the ever changing light, hues, and weather of the majestic Grand Canyon into several minutes of immersive video. American photographer Mark Burns was born December 1958 in Houston, Texas. Known for having a refined “photographer's eye,” Burns creates compelling images that are a unique mastery of composition, lighting, and photographic technique. While very much at home in the studio, Burns especially loves the unique challenges and demands of landscape and location photography. He began working professionally in 1978, primarily as a sports photographer, in Houston, Texas. In the late eighties throughout much of the nineties his professional work shifted almost exclusively to commercial photography. Burns' work has appeared in numerous publications around the world. They include Time Magazine, The Sporting News, The Wine Spectator, Wine Enthusiast, and Wine & Spirits Magazine, to name a few, as well as many other regional magazines, corporate publications, and websites. A master of the black and white image, Burns is skilled in large format photography and traditional silver gelatin and platinum printmaking yet is equally comfortable working in today's digital world. By combining his traditional photography background and expertise with modern digital equipment and a digital workflow Burns believes that he can best express his creative vision. Whether the subject be landscapes, people, nudes, or a still life... today it is the “fine art” image and the archival print that inspires him most as a visual artist. In October of 2015 Burns completed a five year project photographing all 59 of America's national parks in black and white, “The National Parks Photography Project.” This iconic work became an exhibit that traveled to six museums during the National Park Service centennial year of 2016. The highly acclaimed exhibition of black and white photographs had a combined venue attendance of approximately 297,000 people. As he continues to develop as a photographer and artist, Burns strives to keep his images timeless, reflecting a personal vision. Most of the time, this philosophy translates into a photographers personal work. For Burns, it is often evident in his commercial work as well. He says "There are snapshots and there are photographs, a good photograph should convey a feeling or mood, evoke a reaction. Profoundly, it is sometimes what's not so obvious in a photograph that gives it strength." "Grand Canyon Photographs" will be on display February 1 - May 20, 2019.